Dr. Robert Kessler has had a lifelong interest in sports and he first gained certification in the management of sports injuries in 1995. Over the course of the last 20 years, he has served several sports teams as their team physician both on and off the field. Currently, Dr. Kessler is the team doctor for the Live Oak High School football team in addition to providing training for all the sports teams on campus. 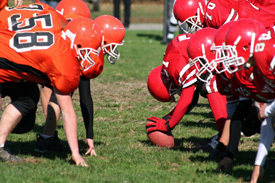 Our office often takes a sports medicine approach to the management of injuries. We agree and support the philosophy of trying to get people back to their life or game as safely and quickly as possible.